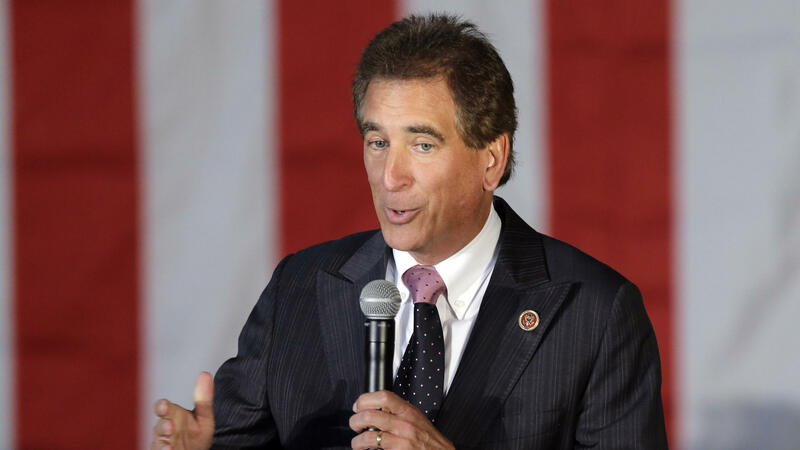 Rep. Jim Renacci, R-Ohio, pictured here in 2014, recently switched from the governor's race to the Senate contest. 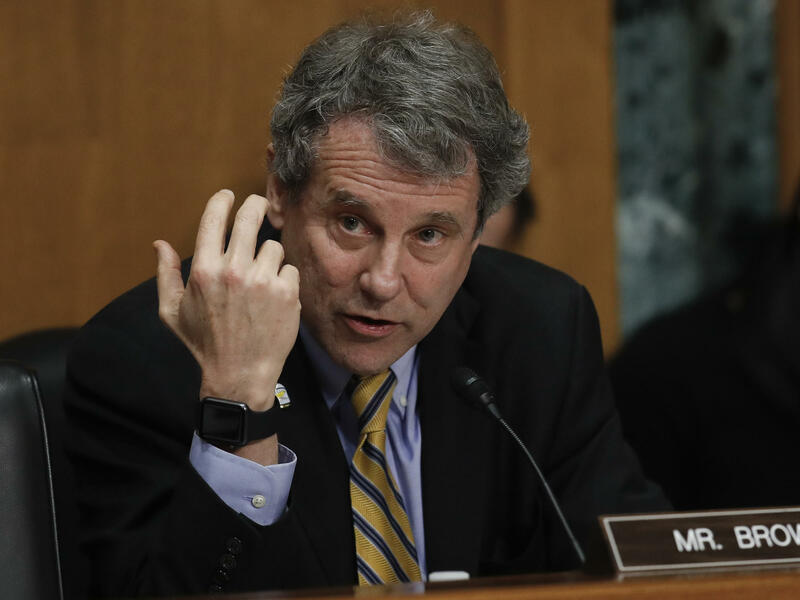 Sen. Sherrod Brown, D-Ohio, is one of 10 Democrats running for re-election in 2018 in a state President Trump carried. When President Trump visited Ohio this week, he had a message for the GOP Senate candidate Rep. Jim Renacci. "Jim, get in there and fight — we need you, we need you," Trump told the crowd. A few weeks ago, White House staff personally intervened to persuade Renacci, who had been running for governor, to switch over to the Senate race to take on Democratic Sen. Sherrod Brown. That is because GOP front-runner Josh Mandel dropped out last month, saying his wife is dealing with health problems. The move set off a scramble since the filing deadline was this past Wednesday. Ohio is just one place where Republicans have struggled to recruit high-profile candidates to take on vulnerable Democratic senators and are left with messy primaries in some key contests, forcing candidates to run to the right in some cases. This is all despite starting the cycle with a golden 2018 Senate map — a silver lining of what could be a difficult midterm for Republicans. Democrats have to defend incumbents in 10 states Trump carried, while only one GOP senator is up for re-election in a state Hillary Clinton won. But now there at least a half-dozen states where Republicans failed to get a top-tier recruit so far or to woo their first pick into the contest. In Ohio, where Trump won by 8 points, J.D. Vance, the author of the bestseller Hillbilly Elegy, had been reportedly courted by Senate Majority Leader Mitch McConnell to run but ultimately passed. Rep. Pat Tiberi, who recently resigned early to lead the Ohio Business Roundtable, also passed on a bid, as had Lt. Gov. Mary Taylor. "Overall, Republicans' recruiting record is decidedly mixed," Cook Political Report senior editor Jennifer Duffy recently wrote. "They haven't gotten their first choices in many of the key races. In several cases, their second choices might prove to be strong candidates, but it is hard to ignore the reality that Republicans are looking at a slate of missed opportunities." Trump is the reason that Democrats and even some Republicans say GOP recruitment is that much harder, while Democrats have plenty of enthusiasm on their side and have had success when it comes to bringing on candidates in both House and Senate races. "There's no doubt that Republicans have had trouble recruiting Senate candidates," said Democratic Senatorial Campaign Committee Chairman Chris Van Hollen, D-Md. "They're facing a lot of headwinds in this election. One, we've got really strong incumbents who are problem-solvers and are known in their states as people who are focused on getting things done. Two, you've got a president who does an awful lot of tweeting, and these candidates don't want to have to answer for every single tweet that Donald Trump puts out." That is one driving force behind the swarm of retirements in competitive House districts, too, and exiting Rep. Charlie Dent, R-Pa., said that same dynamic could be at play in the battle for the Senate, too. "The Democrats should be in a defensive position, but because of the overall political environment, it will be challenging for Republicans to take out any Democrats, and also then to hold those few Republican seats that we need to hold the Senate," Dent said. Matt Borges, a former Ohio Republican Party chairman, argued that there were plenty of personal reasons for candidates in his state to pass on the race that had nothing to do with Trump. "On the one hand, it certainly can be said that we had some marquee names that chose not to move forward," Borges said. "I don't believe that any of those was predicated on the notion that Ohio is going to be unwinnable this year." Renacci still faces a primary against investment banker Mike Gibbons. But now he has a presidential shout-out and quasi-endorsement. Borges said the president can absolutely be a boon for Renacci in both the primary and the general election, pointing out that Trump's approval rating in Ohio remains much higher than it is nationally. Democratic candidates say they know they can't solely run simply against Trump in these states. In Ohio, Brown campaign manager Justin Barasky said the plan includes highlighting areas where the Democrat has agreed with Trump, including on trade. "You know, right after Donald Trump got into office, Sherrod reached out to him and told them that he wanted to work with him on fighting some of these bad trade deals that have cost Ohio jobs," Barasky said. And the campaign knows it can't rely solely on other voters' frustration with Trump to win re-election. "We're certainly always paying attention to what President Trump is doing," Barasky added. "But our campaign doesn't live and die by where his approval rating is." But, Borges acknowledged a risk with Trump. At that Monday event where Trump was supposed to be touting the new tax law, wage growth and job gains — the message Republicans need to be laser-focused on ahead of November — the president veered off course instead and accused Democrats of "treason" for not standing up and applauding during his State of the Union last week. So, the headlines in the state were about that riff and not the tax bill. "Part of that also is taking some of the good with the bad — when [Trump] comes to Ohio and does an event on a very popular issue and then has some remarks that might be good for the base or good for some ink and some headlines, but probably weren't exactly the type of message we were trying to deliver," Borges said. There have been recruiting headaches for Republicans in other races, too. In North Dakota, Rep. Kevin Cramer flirted with a bid and was even wooed by the White House but eventually decided to remain in his safe House seat. There is no clear front-runner in the primary to face Democratic Sen. Heidi Heitkamp. The same thing happened in nearby Montana. Attorney General Tim Fox seemed primed to run but ultimately decided against it. Then-Rep. Ryan Zinke was also considered a top challenger until Trump plucked him to run the Interior Department, though he has had a controversial tenure there. State Auditor Matt Rosendale has jumped in, but he leads a muddled, crowded GOP field. Top challengers haven't emerged yet in crowded primary fields in Wisconsin and Michigan either — two states where Trump scored surprise victories. In Wisconsin, Rep. Sean Duffy passed on running against Democratic Sen. Tammy Baldwin, and in Michigan, Rep. Fred Upton decided against a challenge to Democratic Sen. Debbie Stabenow. Many Republicans have privately grumbled about GOP Rep. Lou Barletta's challenge to Sen. Bob Casey in Pennsylvania, too, worrying that his lackluster campaign could cost them another golden opportunity in a state Trump carried. Even in Missouri, after Rep. Ann Wagner initially passed, it seemed like the GOP had still landed a strong recruit in Attorney General Josh Hawley. But multiple reports surfaced this week that some Republicans were reaching back out to Wagner amid concerns about Hawley's fundraising and recent controversial comments. National Republicans, however, have dismissed those as baseless rumors. Republicans, however, say their polling shows that Democrats in deep red states where Trump won by as much as 20 points remain very vulnerable, regardless of who the candidate is. In fact, in Ohio the GOP may be better off without Mandel — who had plenty of baggage and a history of gaffes — in favor of Renacci, who has a longtime base in the Cleveland area and is independently wealthy. Democrats, meanwhile, have managed to expand their map with strong recruits. They have solid candidates in their pickup targets of Arizona and Nevada, while recruits in Tennessee and Texas could make those races unexpectedly competitive if there is a blue wave that develops. Sen. Cory Gardner, R-Colo., chairman of the National Republican Senatorial Committee, dismissed concerns about recruiting in the Buckeye State and elsewhere as a D.C. story and said the uptick in the economy and the new tax law would help boost GOP candidates come November. "I think Washington is obsessed with the 'who's up, who's down' kind of game when you have good candidates in the race who are going to be very competitive," Gardner said. As for underwhelming fundraising by their candidates, GOP operatives say that there has been some donor fatigue after failing to repeal and replace the Affordable Care Act (aka Obamacare), something they believe will be corrected in the coming year. And they say there is plenty of money from superPACs and other outside groups that can make up any difference. Once voters get to know their candidates, they'll be successful, Republicans argue. One measure of relief may be coming for the GOP in Florida. Republican Gov. Rick Scott is weighing a Senate bid there, and his ability to heavily fund his own campaign would immediately make a challenge against Democratic Sen. Bill Nelson into a marquee contest. But if Scott passes, it would be another major blow for the GOP. NPR congressional reporter Kelsey Snell contributed.